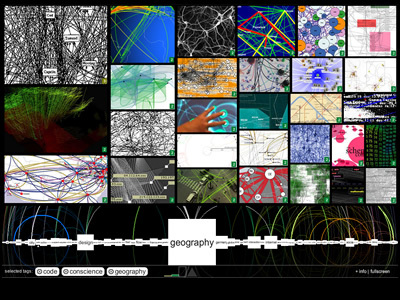 It took a while for reMap to be featured here, but it was probably worth the wait, since it's an extremely suitable project to occupy the 700th entry on VisualComplexity.com. 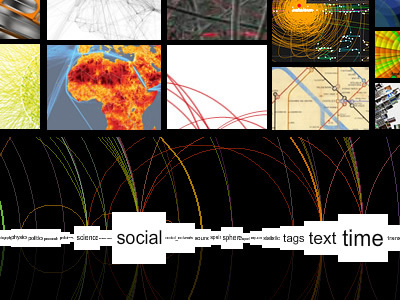 Created by my good friends at bestiario, reMap is a semantic browser of the Visual Complexity database, alowing you to search between different projects based on a series of descriptional tags; every time you change your search parameters, reMap presents you with a new set of visualizations in a stunning graphical interface. The first time Santiago Ortiz told me about the project, back in May 2009, I became immediately excited with the prospect of visualizing this body or work in an alternative way. And when it was eventually published a few months later, it quickly became VC's self-discovery tool. This meta-visualization - a visualization of visualizations - is also highly appropriate for the popular conception of VisualComplexity as a map of maps.